Well I was able to get you another Wild Card Video up and running. 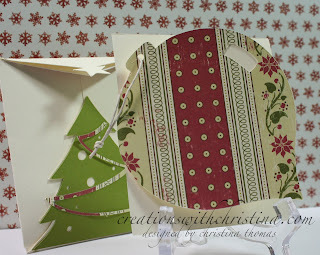 We're working on the Ornament card that is on page 74 of the Cricut Wild Card manual. This is really a cute Christmas card! I was thinking after I tied on the linen thread that if you perforated the side of the card, the person receiving it could hang the ornament on their tree. Wouldn't that be cute? Don't forget next week is my fun filled week with Christmas with the Cricut. How come everytime I look at the guide book I never see these cute cards, you always bring them to life!!! Thanks. I'm with Penny... I never see this cute stuff when I get my WC out. Love this.. that envie is adorable! I'm glad you are doing the Wild Cards again. I love learning what is on this cart that I have and have hardly use. You inspire me with each video!! Everytime I watch one of your wildcard videos it reminds me even more how much I want this cartridge! It's at the top of my Christmas list. Neat card...I think I need to go look at my cartridge...din't know this card is avaiable. Super cute ornament card! You always make it look so easy and quick to put together. Thanks. GORGEOUS! Perfect timing too, I'm going to make this card for Christmas. Now I won't have any problems with the card, Thanks to your tutorial and I'll make it with my Gypsy too cause I should have it in a few more weeks. I'm getting excited!! Fun card. I have this cartridge and didn't know all that was on it. Thank you for showing us what we have. .
What a cute card and neat envelope. I may have to try this one. Thanks! You are doing an awesome job with the wild card series. Please keep them coming. Love this card and envelope. Now I understand a little more on how to use the cards. I am so glad that you show us these cards. I also have a hard time visualizing how they will turn out. So this is a big help.Thanks for doing this. Thanks Christina! I really like that you show how to use the Gypsy...even if I don't have one........YET!!! lol!! Thanks for a great video using WC. I have not used this cart so much because I found it confusing. Now I am learning so much that I am excited about it again! The video for the Wild Card Ornament Card inspired me to use that cut for my Christmas cards this year. Can you tell though, is there a way to cut just the top part of the ornament without cutting the entire ornament? I'd like to make that portion a different color but don't see a way of doing that. I do have CDS but haven't used it enough to know if I can edit the cut to remove portions of it. Can you help me with this? Thanks in advance and I love to follow your blog!